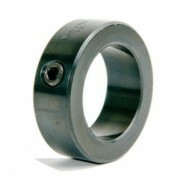 We carry a one piece shaft collars with a set screw or in the split design. There are also a range of different materials available off the shelf. Set screw collars are most effective when used on a shaft made of a material that is softer than the set screw. Ruland set screw collars are furnished exclusively with forged socket set screws for greater torque capacity and improved holding power. Forging of the stainless steel set screws has the additional benefit of work hardening, which results in stainless steel with elevated hardness and performance. 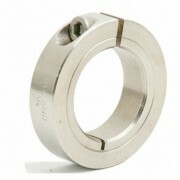 One-piece clamp style collars wrap around the shaft for even greater distribution of clamping forces. This results in a tight fit and greater holding power, without the shaft damage caused by set screws. Ruland uses carefully selected materials and proprietary processes to ensure that the clamping gap remains open for simpler and more precise adjustment. Ruland’s Quick clamp style collars are designed for fast assembly and disassembly of the collar. They are ideal for applications where the collar must be moved or adjusted on a regular basis. No tools are required to connect and disconnect the collar. 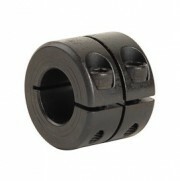 This style of collar wraps around the shaft for greater distribution of clamping forces. This results in a tight fit and greater holding power, without the shaft damage caused by set screws. Ruland uses carefully selected materials and proprietary processes to ensure that the clamping gap remains open for simpler and more precise adjustment. Ruland’s double width collars are available in one and two piece clamp designs in steel and stainless steel. Clamp style collars wrap around the shaft, providing high torsional holding power without the shaft damage and fretting that occurs when set screw style collars are used.